The City of Columbia is working to establish a Climate Action and Adaptation Plan. 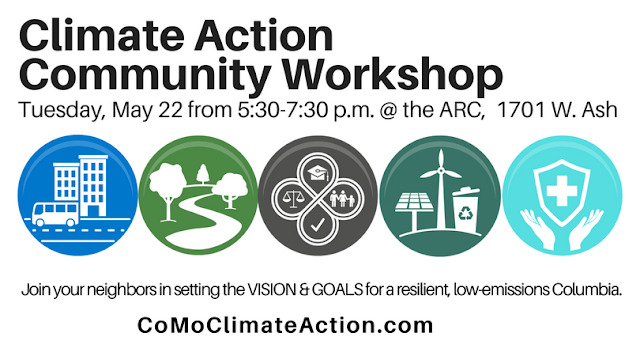 As part of this process, a public workshop will be held from 5:30-7:30 p.m., Tuesday, May 22. (Click HERE for more info.) Peaceworks encourages all concerned about the Climate Crisis to turn out for this event, if possible, as your participation is crucial to demonstrate community concern. In anticipation of this event we have put together a document that outlines some of the concerns Peaceworks hopes will be addressed in the CAAP. We are posting the introduction to this document below, and you can view the whole document by clicking HERE. 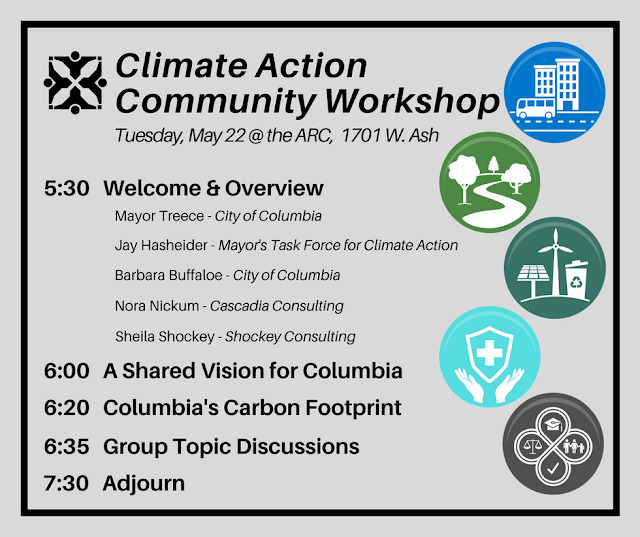 As Columbia works to draft and adopt a Climate Action and Adaptation Plan (CAAP), those of us deeply concerned about the existential threat that climate change poses are eager to see our community become a true climate action leader. This is a classic case of thinking globally and acting locally and it is high time we rise to the occasion. Columbia can be an exemplar to communities throughout our state and beyond, inspiring actions elsewhere that will magnify the impact of our local actions. When thinking of a CAAP, there are several key dimensions to consider. First, while converting our entire energy economy will take decades, we need to commence action as quickly as possible. We need to develop a timeline that leads us to significant, incremental reductions in greenhouse gas (GHG) emissions in the near and mid-terms, as well as net zero emissions in the longer run. The CoMo CAAP must be aspirational—embodying a clean energy, sustainable vision—but it also needs to be pragmatic. The CAAP must be more than just a set of goals. It must be a roadmap laying out the actions to achieve the goals. It also needs to address the question of funding. How will the necessary transition be financed? Here are a few tentative thoughts regarding the CAAP.